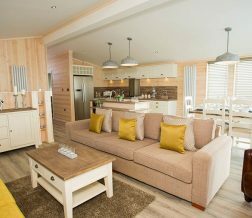 Our luxury lodges are the pinnacle of holiday home design – Spacious, luxurious and often one-of-a-kind. They make the most relaxing hideaway, yet they’re also practical, providing all the day-to-day necessities you require for an extended getaway. 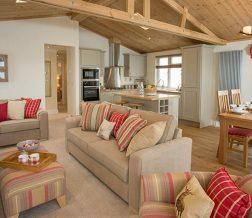 We work with the UK’s leading manufacturers to showcase a range of beautiful lodge holiday homes. 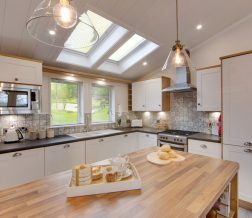 Traditional lodge manufacturers such as Omar, Wessex, Oakgrove, Prestige and Cambrian have refined their designs to meet the ever-increasing demand for greater luxury, comfort and performance. Modern lodges have never looked so good or been so easy to live in. 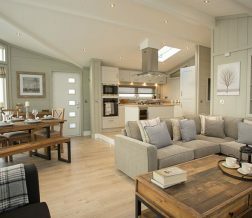 Other holiday home specialists such as Willerby, Atlas, ABI, Pemberton, Regal and Victory are now creating lodges to the same exceptional specification, with their designs frequently becoming bestsellers. Every lodge promises a premium experience in superb surroundings. Often, they’re bespoke so the choice of lodges available to you will depend on the location you’d like your holiday home to be in. Whether that’s by the coast or in the countryside you’re guaranteed the most memorable getaways. Plus, beautiful finishing touches like walk-in wardrobes, dressing tables and kitchen islands. Step into your new premium lodge and you’ll instantly feel at home. Bright, warm and spacious its cosy interior feels welcoming year-round. While the considered and expertly designed décor adds that extra special touch – from the luxury wallpapers and colour-themed soft furnishings to the fully integrated kitchen. It’s the holiday home you’ve always hoped for. At this time of year, the appeal of a lodge holiday home is more apparent than ever! You’ll appreciate the warm and cosy feel from the moment you step inside, wow’d by the expanse of space and light as you explore further. No finishing touch is spared when it comes to décor, with luxury wallpaper, panelled walls, chrome finish, colour-themed soft furnishings and curtains and of course the catalogue-perfect integrated kitchen.